Anyway, I basically started with a few basic beef stew ingredients and then added a few BBQ sauce ingredients and PRESTO! We have a new recipe! I immediately brought some to my Jeanie to see what she thought of it. She liked that you could definitely taste BBQ flavor, but it wasn't like eating a bowl of BBQ sauce. It still tastes like beef stew. Perfect! That's just what I was going for! And it's a snap to throw together! Serve it with fresh bakery rolls with a pat of sweet butter and it'll definitely hit the spot! In a large skillet, over medium high heat, brown beef cubes in oil on all sides. In the meantime, add BBQ sauce and cola to a 6 qt crock pot. Stir to combine. Dissolve the coffee granules in a small amount of hot water and stir into the sauce mixture. Add the vegetables and browned beef cubes to the pot. Season with S&P. Give it a good stir. Cook on low for about 9-10 hours, or on high for about 4-5 hours. When the meat and vegetables are tender, whisk together the flour and water in a small bowl. Add to the pot and let it cook on high for another 1/2 hour or until it's bubbly and thickened. -You can absolutely make this the night before you plan to serve it. Simply prep everything as directed and then keep it covered in a large bowl in the fridge overnight. If you have a crock pot with a removable insert, even better! Then just place it in the crock pot first thing in the morning, and voila! Dinner will be ready by the time you get home from work. 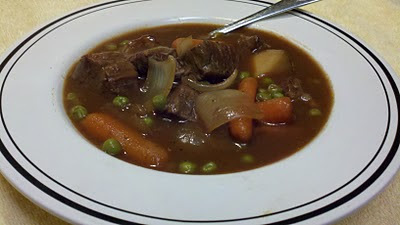 -When I was at the grocery store, the beef cubes didn't look very appealing, so I decided to buy a small chuck roast, and then just cut it into cubes. I also cut off the layer of fat that was on the one side. I placed it in the skillet over a medium low heat, and then slowly rendered as much fat as I could, and then used it to brown the beef instead of using oil. How's that for getting the most from your roast? -My favorite BBQ is Sweet Baby Ray's because it's not too sweet or too spicy or too smokey. But if you have favorite, or if you'd prefer to make Katie Franny BBQ Sauce, go for it! -If there's a particular beef stew ingredient that you like such as corn or bacon or mushrooms or any other veggies, by all means, go ahead and add it! -This can be made in a heavy pot or Dutch Oven. Just prep it as directed, then cover it and place in a 325F oven for about 2 hours.